Apples are one of America's favorite fruits. 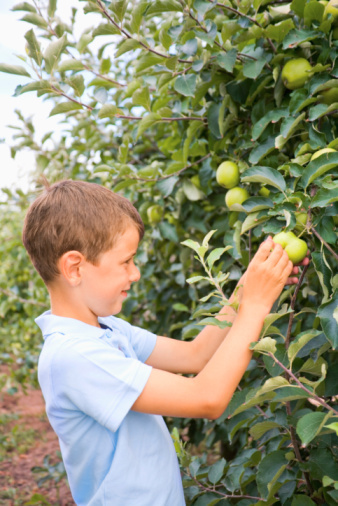 Apple trees also are popular with homeowners due to their easy maintenance and their regular harvests of sweet fruit. 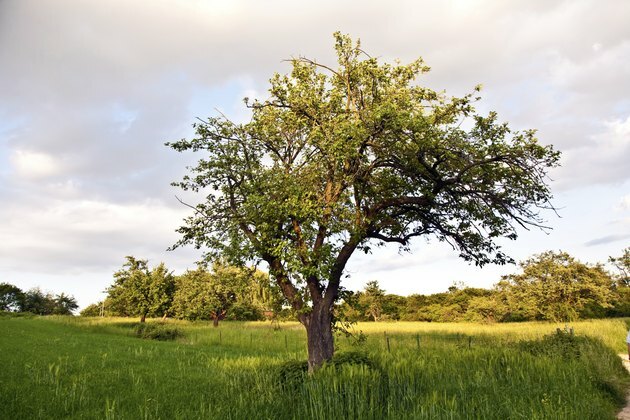 These hardy trees are often found in the wild, as well, growing in deserted orchards or sprouting from seeds that have been dropped by passing birds. To identify apple trees, follow these easy steps. Apples trees growing in an open meadow. A woman reaches up to pick an apple from a tree. Look for the right site; apple trees prefer full sun, with good drainage and plenty of space. Given a choice in the wild, apple trees will grow in an open, sunny spot rather than a shady, crowded area. Look for traditional apple tree structure: semi-broad trunk with wide, spreading branches. Standard apple trees can grow up to 20 feet in height, with an equal spread, or be as small as 10 feet tall (for dwarf apple trees). A close-up of apple tree branches with blossoms. Apple trees have bark that is gray and scaly. 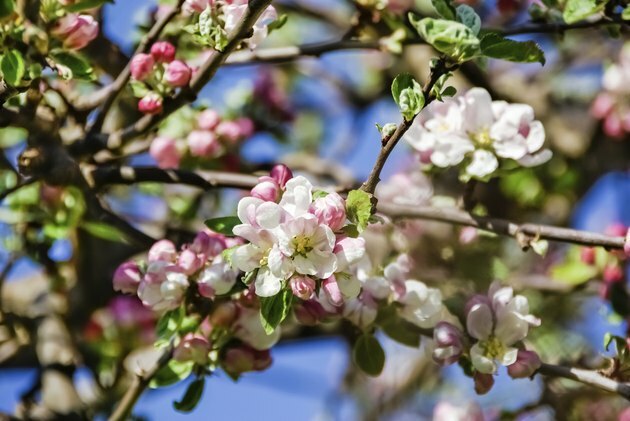 During the growing season, look for apple tree leaves—coarse and oval—and blossoms, which are pink or white, blooming in spring, made up of 5 petals, and up to three-quarters of an inch across. Many apple trees will also have "spurs," or thorn-like growths, along the branches. A close-up of ripe apples growing on a tree. 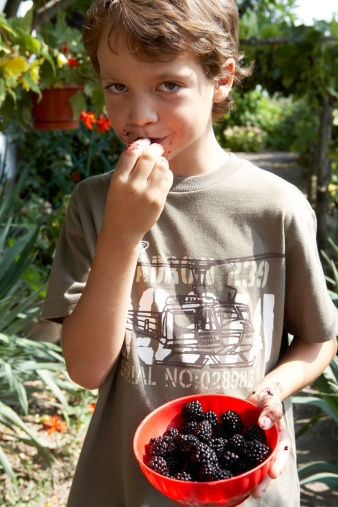 In late summer and early fall, look for the telltale fruit hanging from the branches of the tree. The fruit is the best way to determine what kind of apple tree you have encountered. Use an apple-tree catalog or online resource to find pictures of individual fruit, and match it to what you see. Different varieties also mature at different times, which can help you to determine what type of apple tree you have. Observe the tree over time and record unique facts like the tree's blooming time, the color of the blooms, the size and color of the fruit, etc. to further identify specific breeds of apple tree. 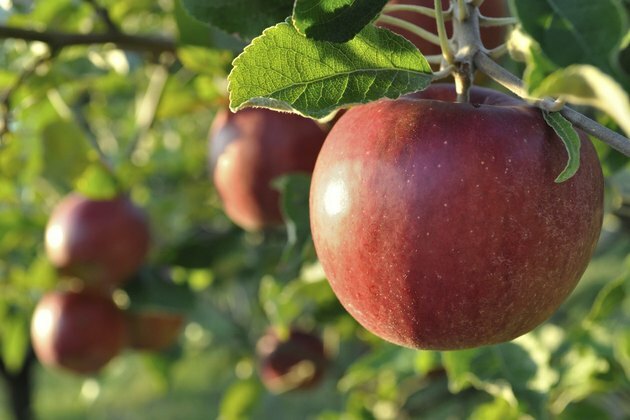 Keep in mind that some apple trees are grafted to produce several different types of apple, so you might find red apples growing on the same tree as green apples. A wooden crate filled with fresh-picked pink lady apples. For apple trees that grow only one type of apple, follow some simple guidelines to identify some of the more popular breeds of apple tree. Trees that produce large, smooth apples that are pinkish on one side and fade to green on the other, and keep their leaves into the winter, are producing Pink Ladies. Trees that grow smooth, glossy green apples that don't ripen until late fall and early winter are likely Granny Smiths. The appearance of clean, dry pink and green striped apples means you might have a Fuji apple. Deep red, glossy apples with broad shoulders are likely Red Delicious. 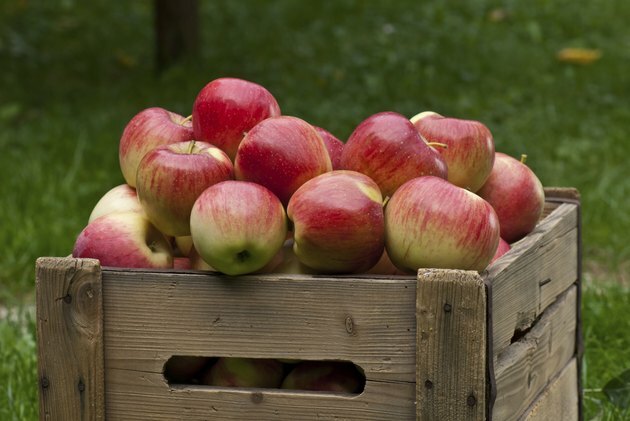 Some apples are more common in certain regions, such as the Arkansas Black in Arkansas or the Baldwin apples of New England. Do I Need a Male & Female Apple Tree to Produce Apples?